There are tons of articles, blog posts, and youtube vids about squatting and deadlifting, but what about the poor leg press? Granted, the leg press is a much simpler movement, but you can still screw it up and hurt yourself if you don’t know what you’re doing. If you know someone who’s herniated a disc on the leg press or you’ve seen the viral video of the guy whose leg snapped backwards on the machine you know what I’m talking about! Follow these simple tips and tricks to stay healthy and develop muscular legs and glutes in no time flat. Set the safety stops – most leg press machines have a latch, lever, or pins that you can set to stop the foot platform from squashing you if you fail to lift the weight. Set the stopping point just slightly lower than you plan to go during the exercise, even when using light weights. Better safe than sorry. Keep your lower back glued to the back pad – be very careful not to let your lower back round and come off the pad at the bottom of the movement. Doing so can put tremendous pressure on your lower lumbar discs and potentially cause a rupture. Back must stay flat on the pad at all times! Do not fully lock out your knees – At top of each rep, keep a small bend in the knees. This will prevent knee hyper extension under load which can damage ligaments. As a bonus, you’ll keep tension on the quads throughout the movement for greater development. Knees and toes pointed in same direction – to avoid torque on the knees. Push through the middle of your feet – avoid pushing through the balls of your feet which can put excessive stress on the knees. Hands off – the leg press is a lower body exercise. Keep your hands off your knees and save your pecs and triceps for the bench press. Warm up – start with a weight that you can easily do for 15-20 reps and gradually work up to your heaviest planned weights for the day. Foot placement – for overall thigh and glute development, place your feet shoulder width apart and about halfway up the platform with your toes pointed slightly out. Place your feet higher to throw more stress onto your glutes and hamstrings; lower to work the quads more. A wider foot placement brings the adductors (inner thighs) more into play. 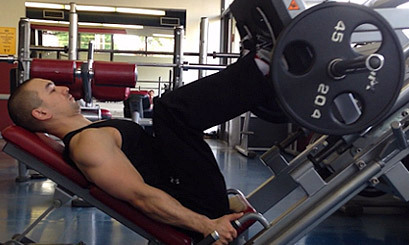 Range of motion – don’t be that guy who loads up the leg press with 1,000 pounds and moves it all of four inches to exercise his ego. Work your muscles maximally by going through the biggest range of motion that your body safely allows. The maximum depth varies based on body proportions, flexibility, and foot position, but as a rule of thumb aim for a 90 degree bend at the knees. If you can go down lower, great, just be sure to stop before your lower back is forced off the pad. A great variation that I recommend is to lower the weight halfway down on the first rep of each set, then lower it slightly further on each successive rep until you reach your maximum depth. That approach reduces repetitive stress on your tendons and allows you to feel the difference in various depths until you find your comfortable maximum range of motion. Weight and reps – you’ll get the most benefit on the leg press using high reps in the range of 10 to 50 per set. Doing so will provide the most muscular development and anaerobic endurance, as well as build a surprising amount of strength with minimal risk of injury. For most sessions I recommend 3 to 5 sets of 20 reps, resting roughly two minutes between sets. How much weight should you use? Depends. A beginner doesn’t need to use much weight to get results, while an advanced lifter needs to use the heaviest weights he/she can handle for the prescribed reps to make progress. If you’re new to the leg press, start conservatively and work your way up to something challenging over weeks or months. That is all. Now get after it!